Even though we’ve had some unseasonably warm temps over the past month, last Saturday marked the true beginning of spring for me: it was the first outdoor farmer’s market of the year in Madison. The farmer’s market is my favorite thing about Madison and while it still takes place during the colder months it is moved indoors and is smaller and just not the same experience. So you can imagine my excitement at this rite of yearly passage. There wasn’t a ton of variety at the market yet but I did manage to pick up some of early spring’s finest: ramps, green garlic, and rhubarb (more on that later in the week). 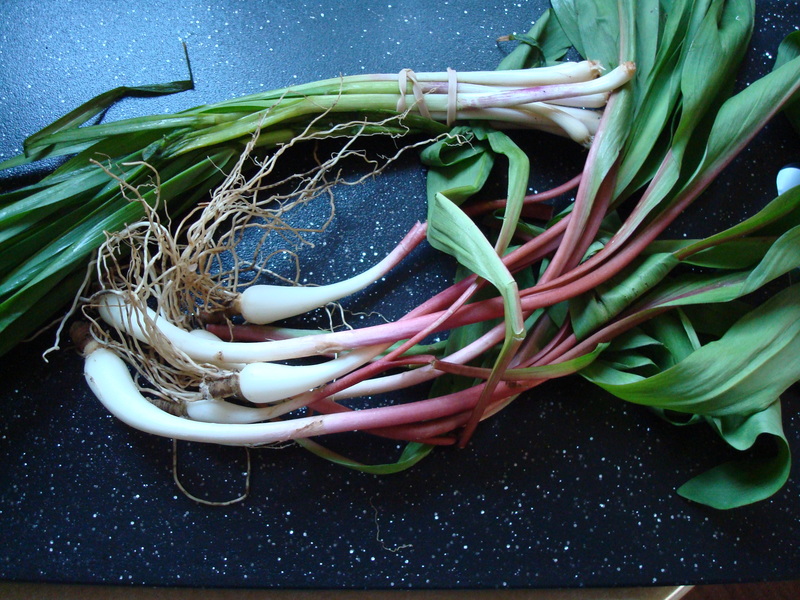 I have never worked with ramps or green garlic before but upon returning home with my bit of nature’s finery I promptly did some Googling and found a recipe for spring pizzas that involved ramps. The green garlic part was inspired by a pizza I had eaten the previous weekend at a great local bakery/pizza place. Done and done. I added some soppressatta because I like cured meat and think it should be a part of most pizzas. I just do. But you could certainly make your version sans meat if you like and that is in fact how the original recipe had it. The base for this pizza is ricotta mixed with a bit of lemon peel. Super simple. Separately you sautee the ramps and green garlic with olive oil and a bit of salt and then layer that over the ricotta mixture. Then add the meat if you like and finish baking. Once out of the oven add some fresh basil and parmesan and a drizzle of olive oil and there you have it. 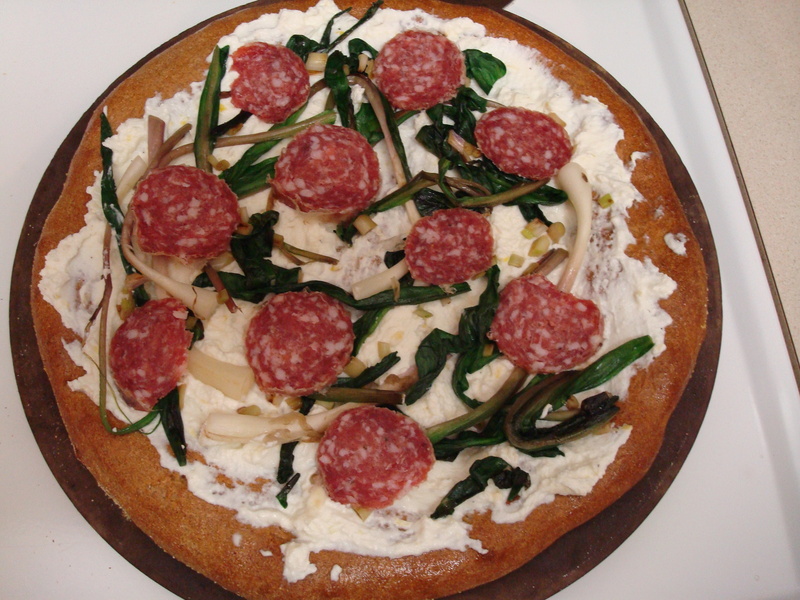 Spring in pizza form. Preheat the oven to 500 degrees F. Brush a baking sheet or pizza stone with olive oil. Stretch the dough into 12-inch round and place on the baking sheet or pizza stone and bake until golden, about 12 minutes. Heat a large skillet over medium heat. 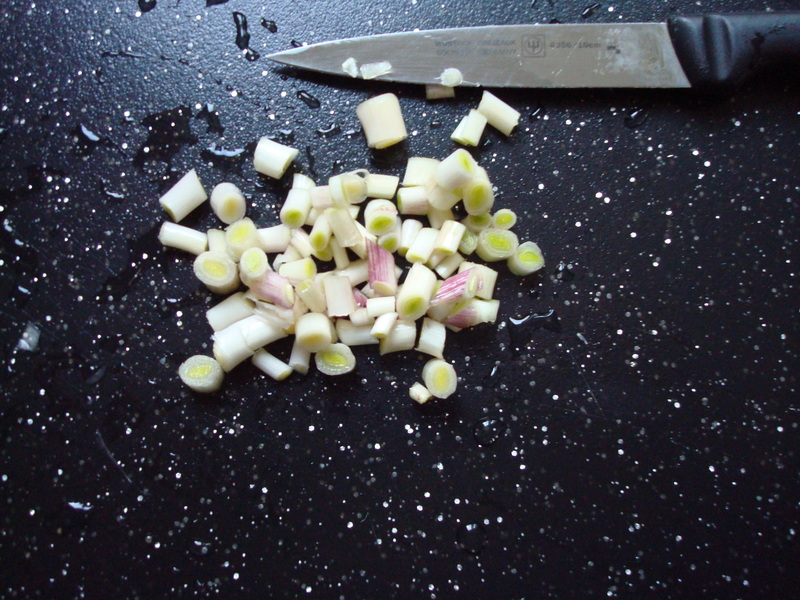 Toss the ramps and green garlic with 1 tablespoon olive oil and season with kosher salt. Saute until ramps are just wilted, about 1 minute. Transfer to a cutting board and cut into pieces. Mix the ricotta, lemon zest, the remaining 1 tablespoon olive oil and some sea salt and pepper in a bowl. Brush the crusts with olive oil (this will protect them from getting soggy), then spread with the ricotta mixture and season with sea salt. Top with the ramps, green garlic, and soppressata. Return to the oven until warmed through, about 2 minutes. Top the pizzas with basil, parmesan and a drizzle of olive oil.